With products and packages for every style of parenting and budget, I have a Gentle Sleep service that is right for your family. The Gentle Sleep Parenting Center is staffed by my Gentle Sleep Coaches® (from over 19 countries around the world) and are waiting, whether by phone or email, to help you and your child get a better night's sleep today. Gentle Baby Solutions is an e-course designed specifically for infants from birth to 24 weeks old. You will learn the important skills necessary to encourage positive sleep associations and habits for your new baby, which will make sleep coaching easier after your child turns 6 months. Gentle Sleep Solutions is my charter e-course, designed for children 6 months and older. This program guides you, step-by-step through my gentle sleep coaching process. The Workbook can be used as a standalone guide and includes all of the essentials, such as lists, plans, and logs needed to help tired parents with children of any age who are experiencing sleep problems. Learn the 52 sleep secrets you need to know in order to help your baby — and yourself — get the sleep you need. 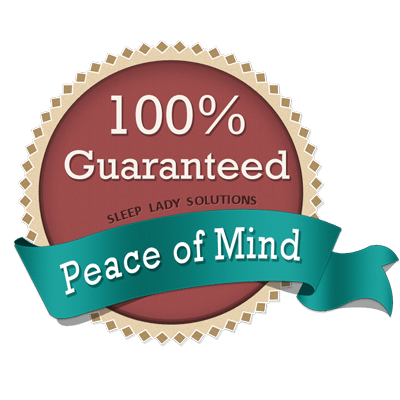 “If you read my review of The Sleep Lady’s Good Night Sleep Tight, you know that I absolutely love her technique. I was having some terrible trouble getting my girls to go to bed and sleep through the night and was in desperate need of some help. I followed her techniques and was able to consistently sleep until my alarm went off. That was unheard of in my home. Read articles about Newborn Sleep on my blog, or sign up for my FREE Newborn Crash Course. This is the time in your baby’s life where they become more mobile, sprout teeth, experience social anxiety, and many start to sleep through the night. But if your baby is used to being rocked, nursed, or walked to sleep it is time to discard those sleep crutches and begin sleep coaching. With changes may come tears, but you don’t need to let your little one cry it out alone with The Sleep Lady’s gentle approach to sleep coaching. Read articles about Baby Sleep on my blog, or purchase the Baby Chapters of my book, The Sleep Lady’s Good Night Sleep Tight for only $2.99. Early toddlers are prone to behavioral sleep problems, while older toddlers test our rules and their limits. Nightmares and night terrors may start, as well as nap transitions, tantrums, and potty training only further complicating bedtime. Learn how to work through all of these toddler challenges and get them napping and sleeping through the night again! Read articles about Toddler Sleep on my blog, or purchase the Toddler Chapters of my book, The Sleep Lady’s Good Night Sleep Tight for only $2.99. Children need a lot of sleep, but they’re clever at figuring out reasons not to get it. This age requires toddler sleep techniques as well as new ones specifically catering to this older, more verbal age group who are often in a bed. Some problems parents may be experiencing during this time also may date back to infancy and take time to resolve. We can help you with all of them! Read articles about Children’s Sleep on my blog, or purchase the Children’s Chapters of my book, The Sleep Lady’s Good Night Sleep Tight for only $2.99. P.S. There are a lot of reasons why your efforts to get your child to sleep through the night have failed in the past – it’s not your fault! Maybe you tried at the wrong time, maybe you didn’t follow through, maybe you missed an underlying condition. I guarantee that my programs above will give you the tools and support you need to change your child's sleep for the better. If you are unsatisfied for any reason, simply send me a message to support@sleeplady.com. I'm committed to bringing about a pivotal and positive changes for you and your child. I believe in running my business with absolute integrity. When describing actual results from my clients, the FTC requires that I also disclose what a “typical” result looks like. Certainly, some customers never follow through with the techniques and see no improvement, but if the thousands of thank you notes I’ve received over the years are any indication, these sleep plans work surprisingly well if you follow the instructions with your child.